A few years ago, searching through the many spectacular internet sites showcasing Fijian Island getaways, I discovered a tiny jewel in the Mamanuca group of Islands. Following my third visit to this idyllic Fijian tropical isle, I considered NOT writing about my experience. I thought keeping my silence would mean less visitors to this particular Fijian Island, allowing me to re-visit whenever I wished. But as a lover of travel and unique places, my conscience got the better of me. To not allow others to share in this special island paradise would be selfish. Besides it seems repeat visitors and word of mouth consistently fill their bures anyway. So what is the name of the Island responsible for luring me back for another two holidays? It is Navini Island, one of the smallest island resorts on the Nadi side of Vitu Levu. Although diminutive in size – a stroll around the entire island takes 15 minutes – Navini has much to offer, including a few Awards. In May 2011 and again in July 2012, Trip Advisor awarded a Certificate of Excellence to Navini Island Resort, for consistently high standard of reports received by Trip Advisor guests. Fresh pancakes and maple syrup – mmmmmmmmmm! 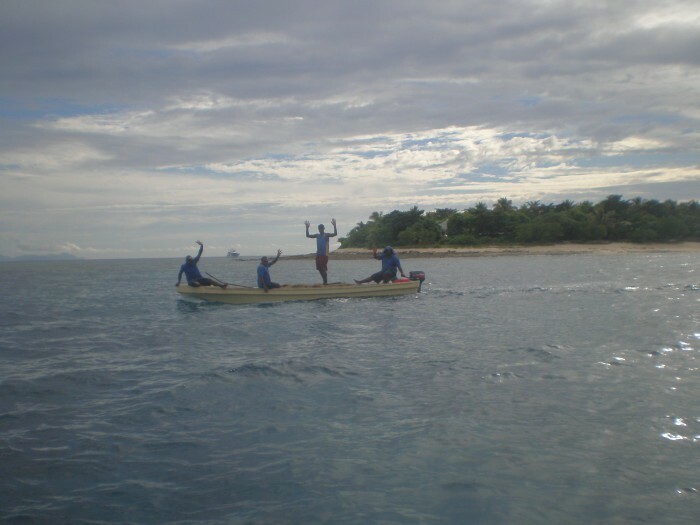 From Nadi airport, a driver greets and takes Navini guests to the marina, where a private boat transfers passengers to the Island, (a trip of about 1.5 hours.) A warm Fijian welcome awaits as we step onto the sandy shore. Settling into one of the ten private, free-standing, beach-facing bures, the sense of island time envelops. Fijian style drums announce meal-times, summoning guests to the communal tables, where the friendly Fijian staff take your order. From arrival, the wait staff greet you personally by name. A simple, yet extremely memorable touch. The freshly prepared menu menu although not extensive, changes daily and is both delicious and satisfying. 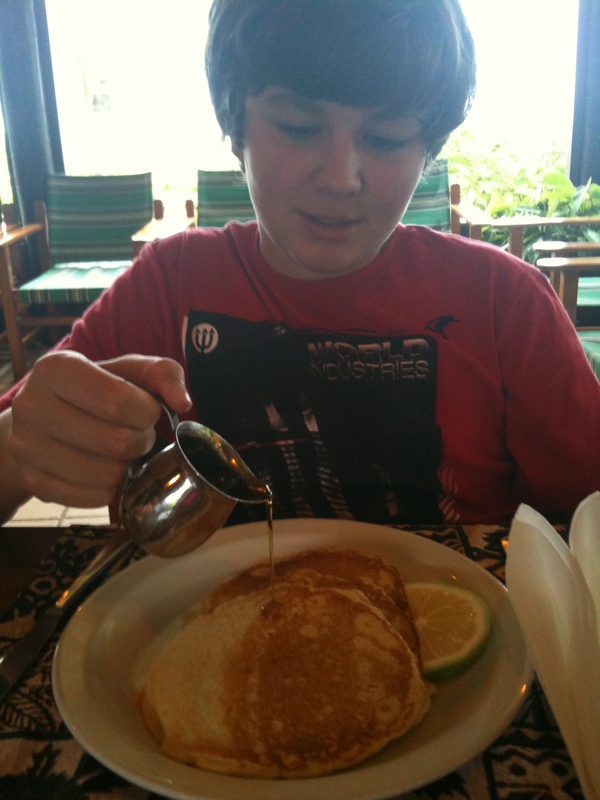 My eldest son highly recommends the breakfast pancakes! A blackboard outside the dining room, displays daily scheduled activities. These include (Monday-Saturday) motorised boat activities*, varying from taking a boat trip to an outer reef for snorkeling or reef fishing, to visiting many of the neighbouring Islands. One island outing involved dropping in on the local Chieftain for ceremonial kava (local brew) and to offer respects. (Note respectful actions include: sitting cross legged around the kava bowl; then drinking its unusual tasting contents, whilst smiling profusely.) Following the lip-numbing kava ceremony, we visit the village school, where local students display the widest smiles. This was an eye opening experience for my kids. Compared to their western school environment, they noticed a lack of computer/electronic equipment. But they also noticed the happiness of the students – it was infectious. Guests who stay on Navini rather than adventure away for the morning, can choose to swim over the coral reefs within easy reach of the sandy shore. 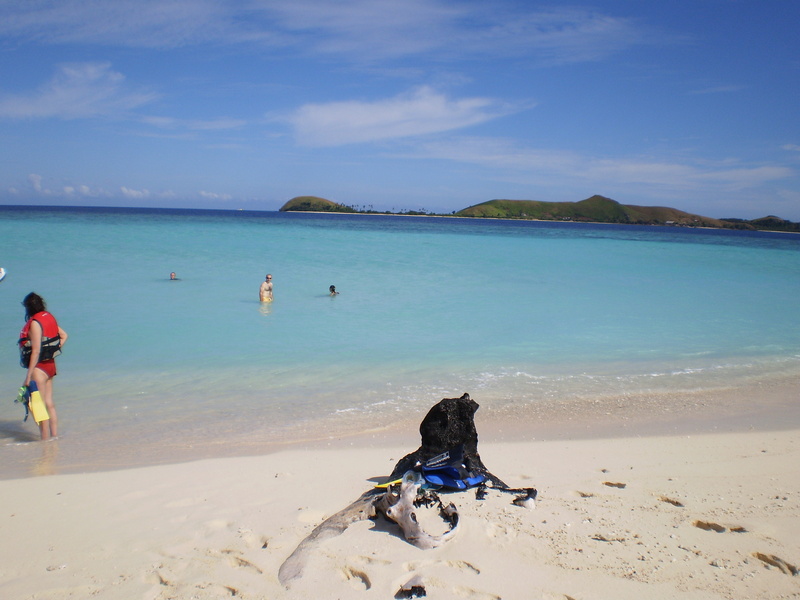 Using the complimentary snorkeling gear, providing the tide is high enough, it is possible to snorkel around the entire island. It’s a real treat to observe beautiful coral and varieties of colourful fish, so close to the beach shore. At 5pm (except for Sundays) the distant call of “volleyball “, summons guests to join the local staff for a game of beach volleyball against (or with) them. Recruiting the sporty and once-sporty minded guests – kids and adults – are welcomed to use whatever ball skills they have to throw at these Fijian (supreme) volleyball athletes. Watching them play is pure entertainment. The friendly rivalry and ribbing among the staff indicates their happy spirits working on Navini. Post-dinner, a few guests bid “good-night” and wander back to their bure, while others stay to continue conversations into the evening. The staff, who gather after dinner to relax and socialise, serenade us with their harmonious singing and ukulele playing. There is something incredibly special about the Fijians and their natural ability to sing so joyously. Sweet, happy voices singing softly into the night is one of my most treasured memories of Navini. 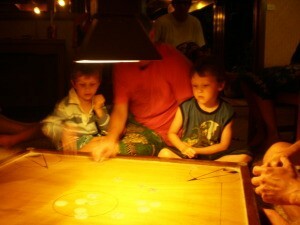 Another is the after dinner (informal) sharing of kava and (attempts) to compete with the local experts in a unique game they call, vindy vindy. Without TV or internet access, by the second night the stresses of the Western World seem miles away. Succumbing to Navini’s gentle routine, leaves you with no other choice but to relax. Your only wish will be to push back your departure date – further and further away. Despite my initial thoughts to keep quiet about this magical place, word of Navini has spread. During my last visit, guests included honeymooners from the UK and America and a family (with young toddlers), travelling all the way from Norway. Aussie and Kiwi guests, many repeat offenders (like myself) relish returning to be embraced by Navini’s unique hospitality. 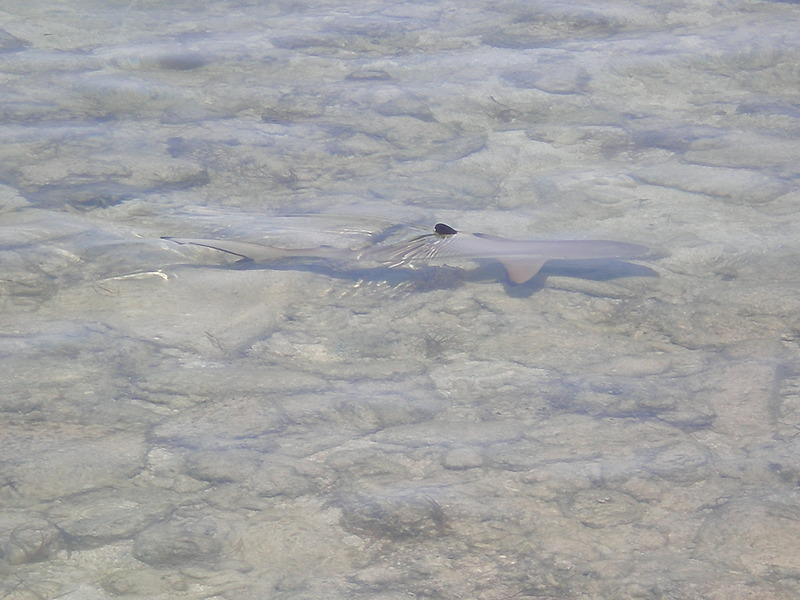 It’s smaller size is what separates Navini from other islands. It allows for personal treatment, where you feel more than a guest – you are part of the Navini family. Sharing my secret, gives you the chance to experience a relaxing, personalised, unforgettable holiday. You will want to return – guaranteed. 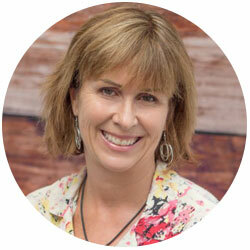 If you enjoyed my story – please like me on my facebook page: Travel bug Within. *Navini Island Resort includes all motorised boat activities in the Bure price. Note: All transfers, flights and accommodation were paid by the writer. aarrgghhh…… could handle a bit of this right now! Very evocative – I like it! Thanks for writing – if possible I am even more excited about my upcoming trip. I am traveling from the US with a 3 and 6 year old. I don’t believe my children will get bored with swimming and playing on the island but figured I should check with someone who was there with small kids. Was there enough to keep the children entertained? Thank you. So good to hear you are looking forward to travelling there! My youngest kids were 8 when we last stayed and loved it – a few years earlier when they were not so confident in swimming we took along blow up rafts so they could float on these and see the coral down below. 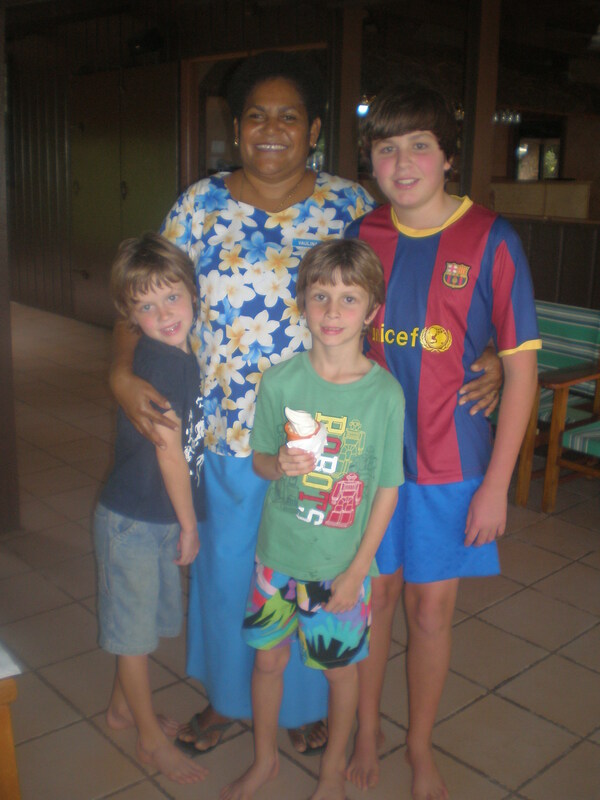 The Navini staff are so friendly they will look after and look out for your kids. As long as the kids don’t require electronic entertainment they will be fine ! The reef trips and activities will keep them happy. I know you won’t regret it. You will get the chance to relax as well – always a good holiday!! it is a very special place – I would love to go back one day too – even though there are so many other islands to entice, Navini will always be a stop in.